Spring celebrations wouldn’t be the same without one classic centerpiece: leg of lamb. 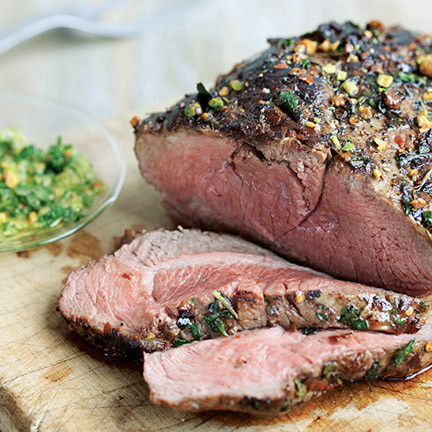 Whether roasted or grilled, a leg of lamb is a tried and true addition to the Easter or Passover table. As elegant as it is, it’s also quite simple to prepare. 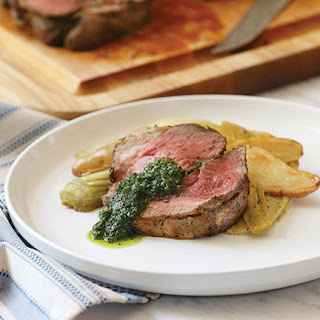 For a new take on tradition, swap conventional mint jelly with a vibrant salsa verde or mint-pistachio pesto for a fresh, but familiar, flavor that complements the rich taste of American lamb. For generous portions, figure on one half pound of American lamb per serving. Use a good meat thermometer to determine doneness. Medium Rare: 145°F; Medium: 160°F. Remove the roast from the oven when the internal temperature reaches 10 degrees less than your desired temperature; it will reach desired doneness while it rests, allowing the meat’s juices to settle. Carve the roast across the grain so the meat will be tender. Position rack in lower third of oven (so roast will be in the middle) and heat to 325°F. Spread salsa verde paste over interior of meat to edges, rubbing into crevices. Reserve remaining salsa verde. Roll lamb up lengthwise into cylinder. Use kitchen twine to tie cylinder at 1 1/2-inch intervals. Tie another piece of twine lengthwise to secure ends. 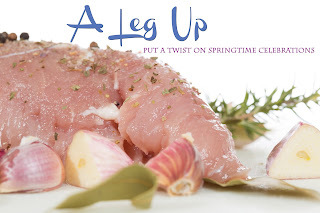 Allow lamb to sit at room temperature 1-2 hours before roasting. (If you plan to wait more than 2 hours before roasting, loosely cover and refrigerate roast, but bring to room temperature before cooking.) Pat outside of roast dry using paper towels before roasting. Trim dark green tops from leeks. Halve leeks lengthwise and rinse well. Pat dry and cut into 2-inch pieces. Put leeks and halved potatoes in large roasting pan. Drizzle vegetables with olive oil, season with remaining salt and toss to coat. Spread vegetables around roasting pan in even layer. Place lamb roast on top, seam-side down and transfer to oven. Roast until an instant-read thermometer inserted into center of meat reaches 135°F for medium-rare, about 1-1 1/2 hours. Transfer lamb to cutting board and allow meat to rest for 20-30 minutes, loosely covered with foil. 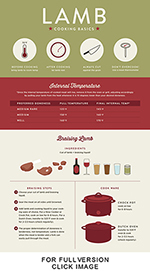 (The internal temperature will increase to 145°F.) Bring reserved salsa verde to room temperature. Toss vegetables in roasting pan to coat in pan drippings. If they are tender and browned, set aside in a warm spot while meat rests. If not, return to oven to finish cooking. Heat grill to medium-high. Grill lamb leg to medium-rare (remove from heat when thermometer reads between 130°F and 135°F), or to desired doneness. Rest meat, lightly covered, for at least 10 minutes before serving. Slice meat across grain into thin slices.